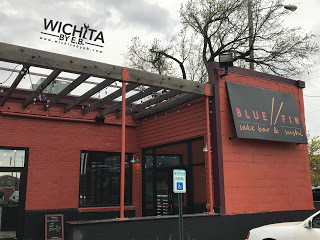 First Look at Blue Fin Sake Bar – Wichita By E.B. Blue Fin Sake Bar is the latest sushi restaurant to hit the streets of Wichita in the former Taste and See building. 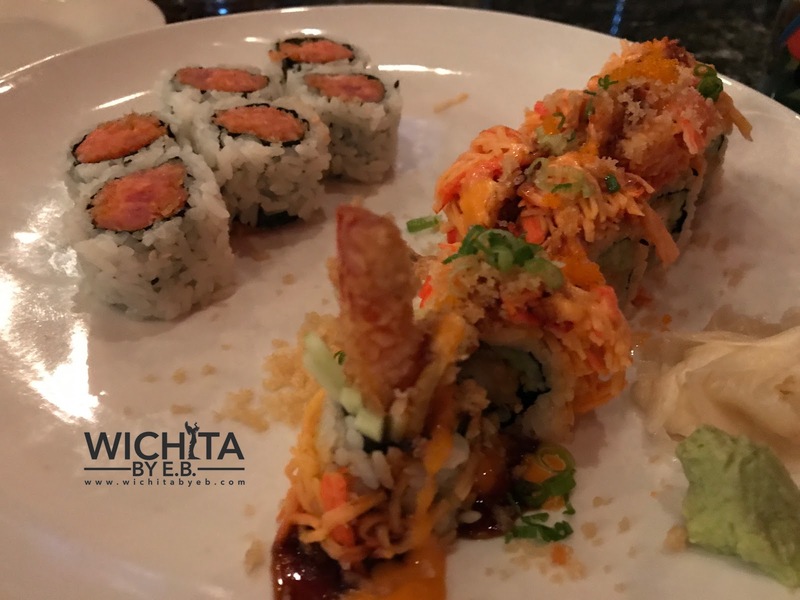 They are the third sushi restaurant to be located downtown with Hana Cafe and Wasabi. For me personally, it’s nice to have that third option as I don’t frequent Hana Cafe often and Wasabi mistreated my family once and we refuse to ever go back….but that’s a whole other story. Inside Blue Fin Sake Bar, there’s plenty of seating and a fully stocked bar. There’s a real modern upscale feel to it where it’d be great place for a night out with friends, a date night, quick lunch, whatever you desire. My family and I stopped by last week to check them out and see how their first week of being open was going. 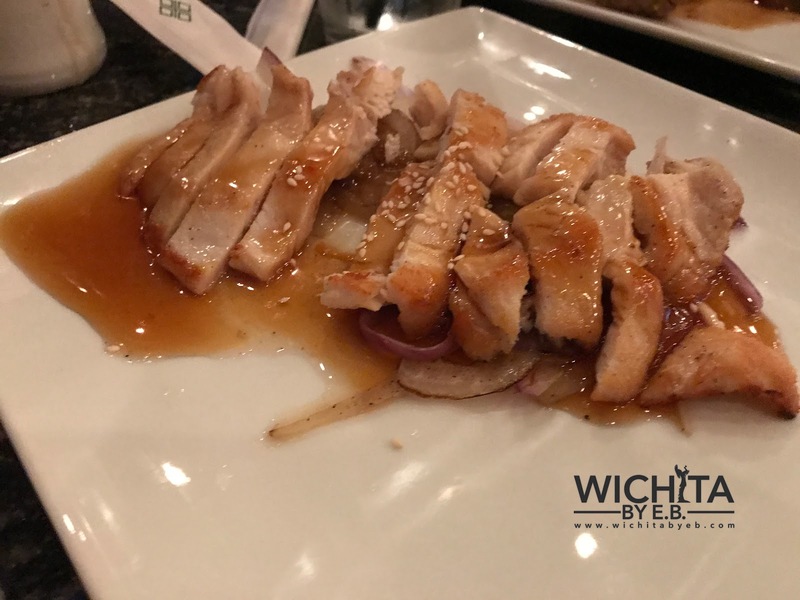 As with all First Looks, we will be a little more forgiving on certain aspects as many restaurants are trying to get a grasp on processes moving forward. On a weekday, Blue Fin Sake Bar was very busy. For a party of eight, our wait ended up being roughly twenty minutes. Once we were seated, a server was quick to take our drink order. After that we all made our orders. 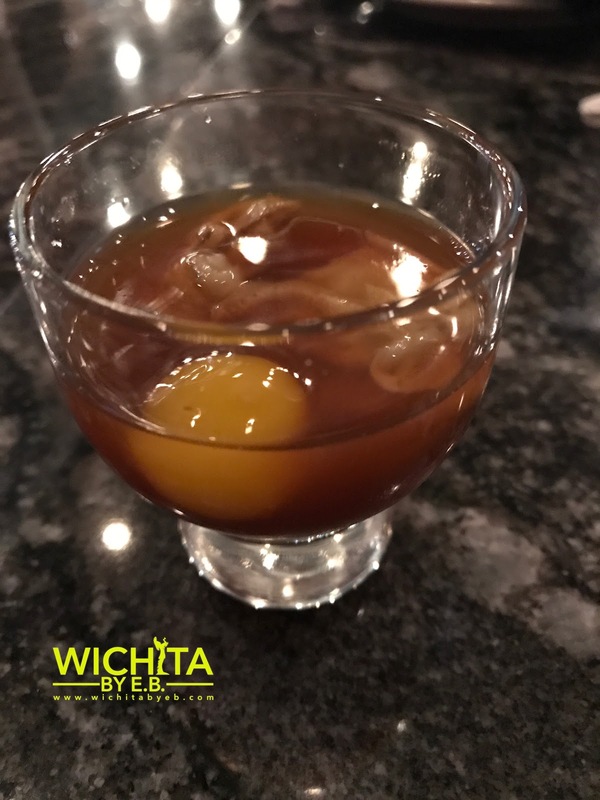 We started off with two orders of Gyozas and I wanted to try an Oyster shooter. I ordered one Oyster Shooter at the request of a colleague of mine who was interested to see what it was like. It consisted of an oyster, quail egg and Ponzu. It was definitely interesting. Ponzu from what I gathered is a citrus based sauce. It was really really really sweet so that mixed with the quail egg and oyster made for an entertaining moment for my family as they watched me drink it all. I like to say I’ll try most things once and once was enough for me. I learned that Oyster Shooters aren’t for me. 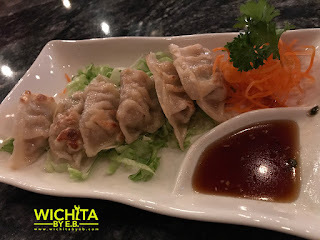 My nieces plowed through the Gyozas. Our server only brought us out one order but we didn’t bother to say anything. 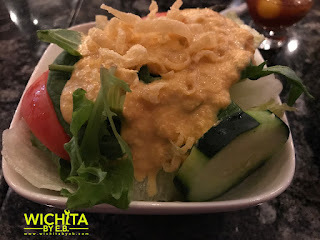 For starters, we had ordered two orders of the Spicy Tuna and only received one. Later on, we would find out they only charged us for one Gyoza and one Spicy Tuna. Everyone enjoyed their sushi. It was certainly better than the other options downtown. Of all the rolls, my personal favorite was the Volcano (Tuna, salmon, avocado with chef’s special sauce). 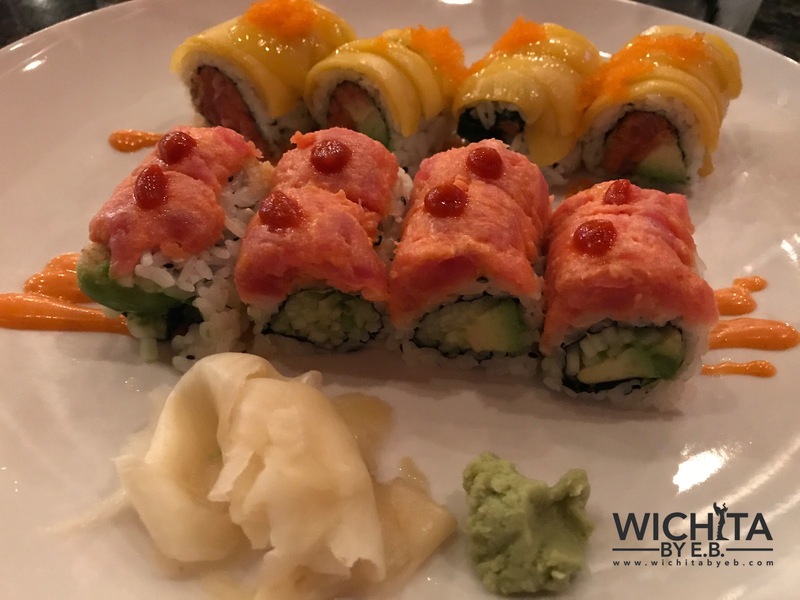 Other favorites at the table included the Hot Damn (Avocado, cucumber, spicy tuna with spicy mayo sauce topped with hot chili oil) and the Firecracker (Shrimp tempura, cucumber topped with spicy kani, crunch, masago, scallions, eel sauce and spicy mayo). 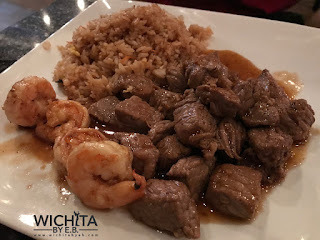 The other meals like the Kid’s Teriyaki and the Shrimp and Steak were your standard rice and meat meals commonly found at many other Asian restaurants. It wasn’t bad but it wasn’t something to write home about. 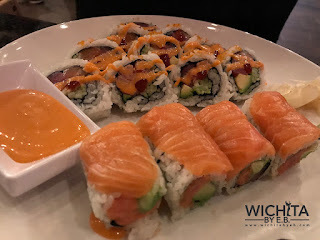 Most people who go to Blue Fin Sake Bar will most likely be going for the sushi. The quality was good and the prices were fair. My family mentioned they were a bit slow on the service and had a couple mess-ups but not so bad that it ruined our experience. Hopefully those are some items that can be fixed over time. One thing for sure though is everybody on staff was incredibly nice. Everyone had a smile on their face and would always ask how things were going when they stopped by. Overall this is a place we would visit again in the future. 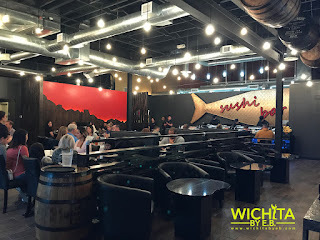 We hope to check back again in a few months to see how things are going with Blue Fin Sake Bar. In the meantime, we can give this place our recommendation. It’s already the best we’ve had downtown.